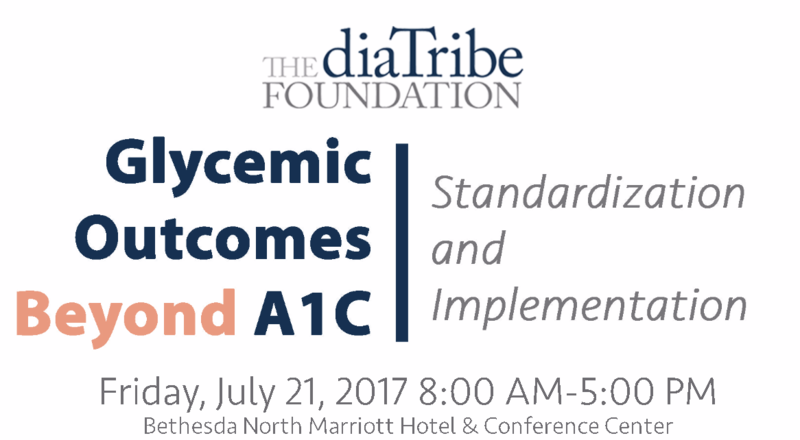 The diaTribe Foundation gathered leaders in the diabetes community on July 21, 2017, to host a discussion on “Glycemic Outcomes Beyond A1c: Standardization and Implementation.” With the #beyondA1c movement having taken great strides in the past year (read more here on why A1c alone is not enough), Friday’s gathering convened experts from the US and Europe to reach a consensus on which glycemic outcomes beyond A1c are important and how to report them in a standardized way. Glycemic outcomes that were discussed included measures such as low blood sugar (hypoglycemia), time spent in-range, and high blood sugar (hyperglycemia). This landmark meeting was a culmination of two years of work made possible by many groups, including The diaTribe Foundation. 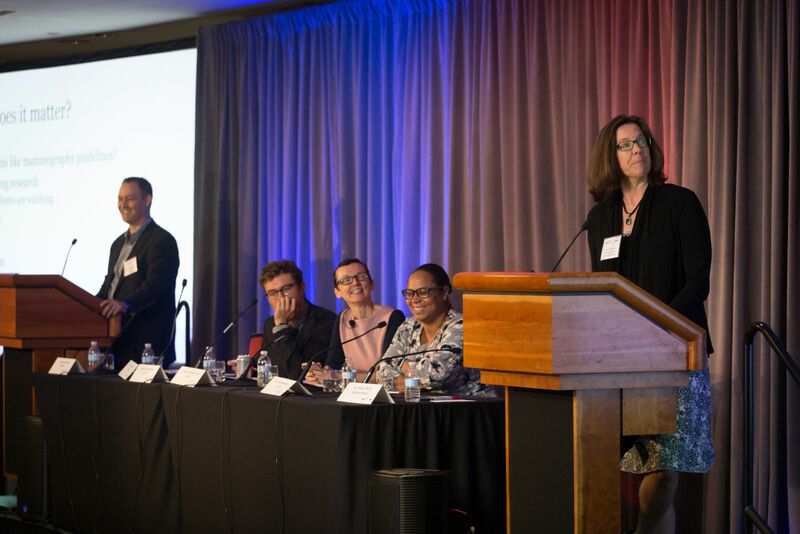 In November 2014, The diaTribe Foundation worked with the FDA, JDRF, and ADA to bring patient advocates to the “FDA-Patient Dialogue on Unmet Needs in Diabetes.” Representatives of the diabetes community identified measures such as time-in-range, frequency of low blood sugar (hypoglycemia), and weight change as outcomes that were especially impact daily living with diabetes. 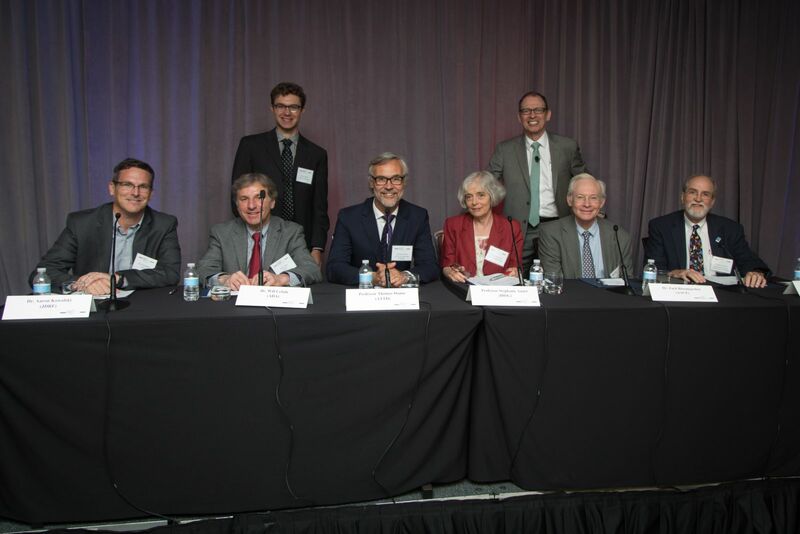 In August 2016, that event was followed by a public workshop at the FDA on “Diabetes Outcome Measures Beyond Hemoglobin A1c (HbA1c)” that identified standardization, collaboration, and implementation as key goals for the outcomes beyond A1c movement. “Patients have CGM data and are using it now. Attendees all agreed that A1c is not enough and using CGM to measure additional outcomes could meaningfully change how therapies are developed, how the FDA thinks about the benefits and risks of those therapies, and how people with diabetes and healthcare providers understand the value of those therapies. For instance, a new drug that does not change A1c, but reduces highs and lows would be very meaningful to people with diabetes. 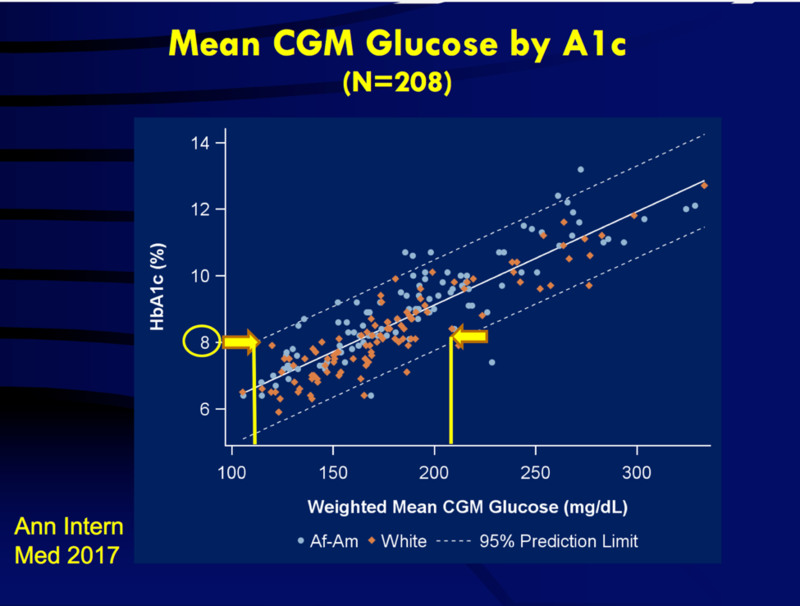 As CGM is the best tool available to measure that benefit, it was suggested that the FDA should use CGM data in trials to fully appreciate non-A1c outcomes that significantly impact people with diabetes. So, what was agreed upon? A glucose measure below 54 mg/dl was considered to be very meaningful hypoglycemia that urgently requires treatment and has serious side effects if not quickly addressed. A glucose measure below 70 mg/dl but above 54 mg/dl was considered an alert level for hypoglycemia – warranting action and a reminder that glucose levels are approaching a more dangerous zone. A glucose in the range of 70-180 mg/dl was considered “in range,” serving as a target that could apply widely to many people with diabetes. Over 180 mg/dl was considered to be high blood sugar (though many presenters noted that some people with diabetes can “spike” to 180 mg/dl or higher after a meal). Finally, blood glucose over 250 mg/dl is considered very high and may require additional treatment actions, such as testing for ketones or, for those who wear pumps, determining if the pump site has failed. 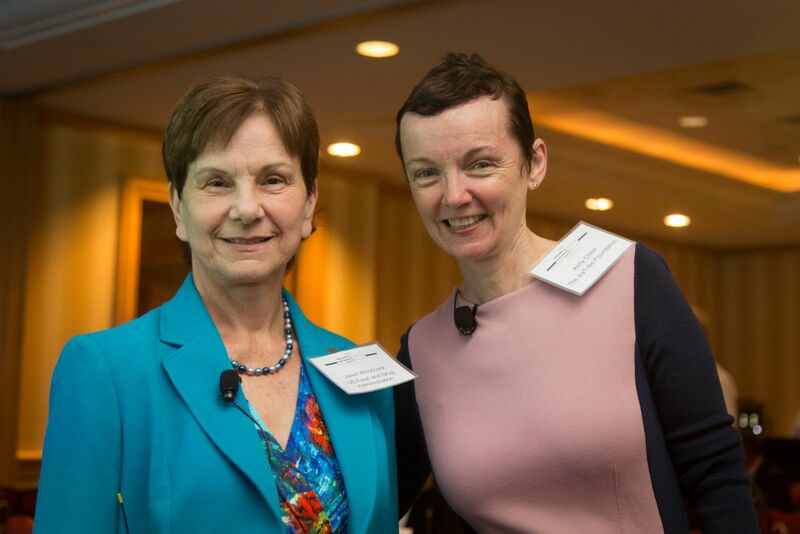 Speakers also agreed that the most dangerous classification for low blood sugar – “severe hypoglycemia” – would describe when a person with diabetes requires assistance from another person (e.g., a caregiver or healthcare provider) to treat a low. This would not be measured directly with CGM, but is a critical outcome beyond A1c that must be tracked and reported routinely. While discussing numerical cutoffs may seem overly technical to some, after last year’s August 29 meeting hosted at the FDA, many realized that manufacturers and regulators need to use standard measures on how various treatments affect people with diabetes. If time-in-range or hypoglycemia are defined differently from trial to trial and drug to drug, it creates a lot of confusion. Moving forward, these standard thresholds will be important for consistently understanding how well and safely new products work. Some disagreement remained on what “terminology” to attach to different glucose ranges – for instance, should hypoglycemia less than 54 mg/dl be called “serious,” “very low,” “significant,” or something else? By the end of the day, many agreed that using the numerical values alone – avoiding the terms entirely – may be the safest way to go. 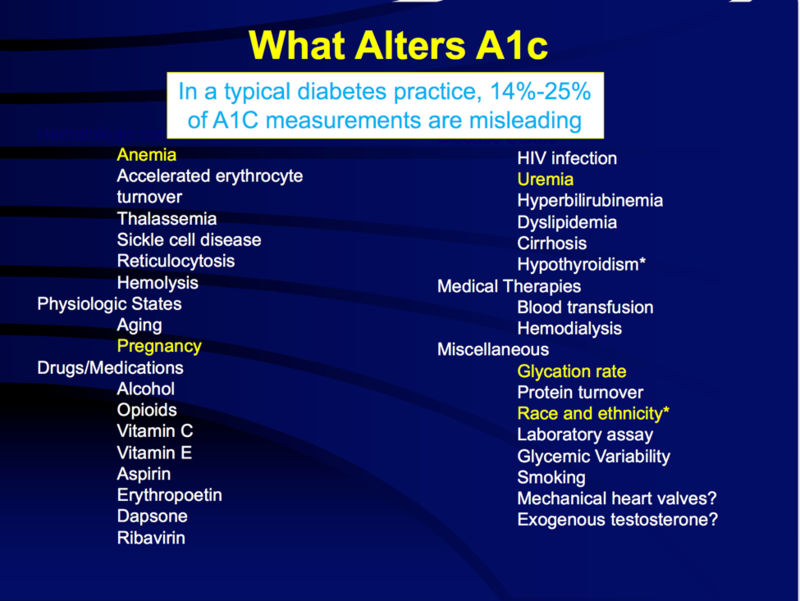 Several speakers noted that A1c can be misleading in an individual, since so many factors influence an A1c beyond just glucose – Dr. Robert Ratner pointed out more than 32 factors that can influence an A1c, including anemia, certain drugs, pregnancy, and more! Dr. Rich Bergenstal added that an individual with a mean glucose of 183 could be predicted to have a measured A1c of 7% or 8% or 9%! Meanwhile, a person with an A1c of 8% could have a mean glucose ranging from 155 mg/dl to 215 mg/dl. (Read more on this topic here.) For understanding how a person with diabetes is doing overall, experts advised looking at the mean glucose, a metric best measured with CGM. People with diabetes demonstrate tremendous variation in glycemic control for a given A1c level, with an approximately 80 mg/dl range in average glucose for the same A1c level. Notably, on future research, most in the room argued that CGM devices (e.g., those made by Abbott, Dexcom, and Medtronic) should be more widely used in diabetes drug trials, particularly to capture endpoints like hypoglycemia (especially overnight) and the impact of therapies on time-in-range and hyperglycemia. Attendees felt that these devices have now matured to allow meaningful and accurate collection of these glucose endpoints – data that cannot be captured with fingersticks or A1c values representing a rough three-month average. 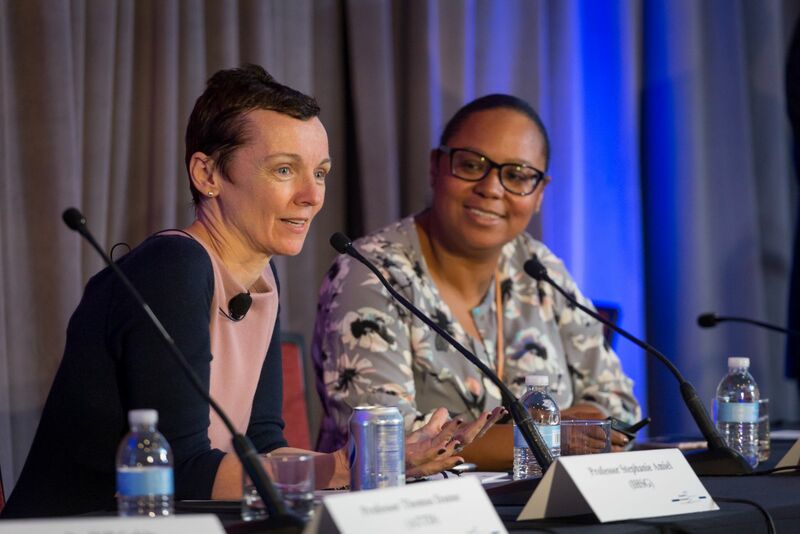 Read on for more from the day’s presentations and workshops, including some Quotable Quotes about outcomes beyond A1c. Glycemic Outcomes Beyond A1C from Abigail on Vimeo. 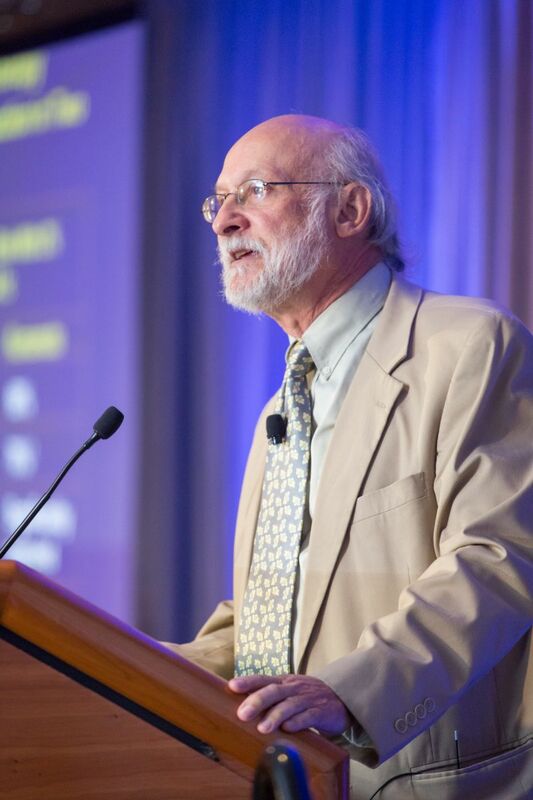 The diaTribe Foundation is pleased to share the Glycemic Outcomes Beyond A1c Resources page, which includes coverage of the July gathering and the meetings leading up to "Glycemic Outcomes Beyond A1C", materials from the day (i.e. agenda, presentations, patient video), notable journal articles written on glycemic variability, hypoglycemia, future clinical trials, and implementation, and a link to view the entire meeting.